Two women observing a creek and the damage caused by flooding on October 31, 1981 at 570 18th Street. 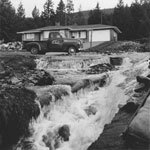 A view of a creek, damage, and rubble caused by a flood on October 31, 1981 at 570 18th Street. A woman's back can be seen observing the scene in the left edge of the print. View of steel bridge over Capilano River at Marine Drive after flood damage, November 1949. Group of men standing on edge of washed out bridge. A view of logs, branches, and damage in a garden caused by a creek flooding on October 31, 1981 at 570 18th Street. A view of a parking lot for Ernie's (Kentucky) Take Home at 1783 Marine Drive filled with rubble and damage from a creek flooding on October 31, 1981. A car can be seen in the right corner of the print surrounded by rocks and concrete. A crane helps with the reconstruction of Mathers Avenue after flooding in 1949. View of flooded Capilano River looking through trees to collapsed Capilano River Bridge. Note from original catalogue states that a Bailey Bridge was built alongside to handle traffic. Original print has a sticker label. View of collapsed Capilano River Bridge after 1917 flood. View of steel bridge over Capilano River at Marine Drive after flood damage, November 1949. View of collapsed Capilano River Bridge during flood of 1917. View of washed out Capilano River Bridge, December 1917. Bridge reconstruction over Capilano River after flooding in 1949. Photo of flooded culvert at the corner of Palmerston Avenue & 26th Street. A crane is used for bridge reconstruction over Capilano River after flooding in 1949.